Today's post on clean eating (as well as our last fashion-related post) were both reader requests that I wanted to address as I've been meaning to write these posts for weeks now but had fallen a bit behind. I've actually received a few messages from those in our Facebook Community as well as by e-mail asking me questions about both diet and exercise after seeing my instagram shares, previous posts I've written on the topics and things I've mentioned in passing on our Facebook page. Since there has been a lot of interest, there will be more posts of both to come! 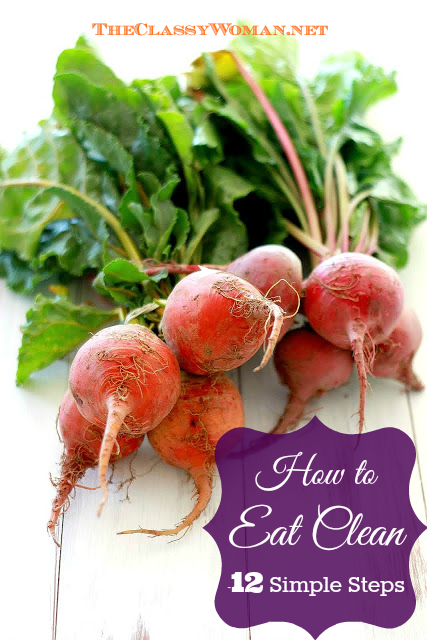 Before I begin, let me start off by saying that this is my personal guide to eating clean. Everybody starts somewhere different along their healthy and clean eating journey, this is just how I choose to live. Since I was asked about my own practices and clean eating principles, they are what I'm sharing with you here today in the hopes that some of my ideas and tips can help others who wish to live a more clean lifestyle along with a regular reader who originally requested this post. Please note that while I'm sharing 12 steps to clean eating, you may not necessarily implement all of them at one time, in fact, I recommend not doing that. Making healthier choices is a journey, trying to do too much at one time can set you up to fail as you may become overwhelmed and just give up instead choosing old patterns. Take your time, it's a process, why not try just one of the tips then work your way to another, some naturally work together such as increasing water and decreasing and eventually eliminating soda. Everyone handles their journey differently and please note for me this was an evolution over the past 15 years not in a few months time. Some of you may already know I'm really passionate about health. I am a former personal trainer having coached many people in the area of nutrition. While attending College I also managed a health nutrition store. 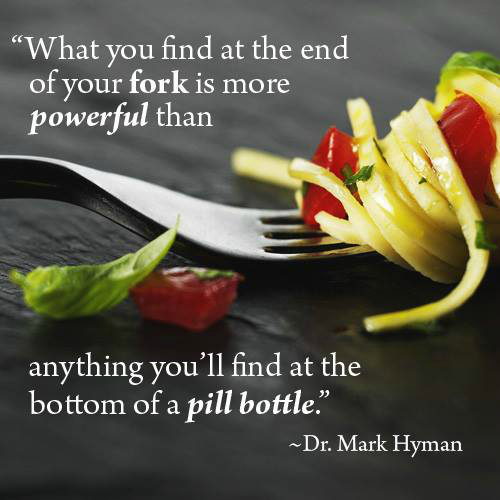 To this day I still have many people that come to me asking about supplements, recipes and how to eat clean while still enjoying the taste of their food (I think that's the part the keeps most people from eating more healthfully, they fear it won't taste good). When I graduated, while I learned a lot and appreciate my Marketing Degree, if I had to do it all over again in terms of education I would probably have become a Naturopathic Doctor. Who knows, I still may one day. Over the past 15 years since I became really interested in optimal health my ideas on eating healthy have changed. You see, everyone starts in a different place and make changes for different reasons. For me, I was raised by parents who ate healthfully and taught me how to cook. 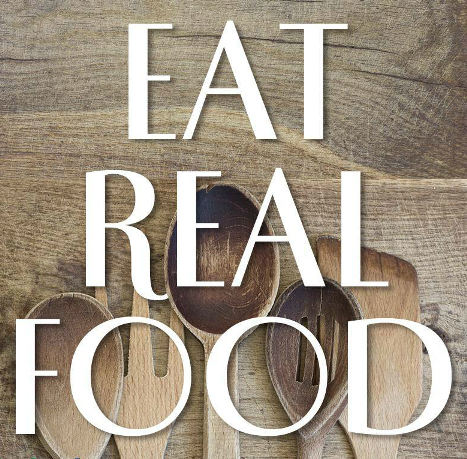 I think that is half the battle personally, when others prepare our food or we choose pre-packaged foods, we really don't know what we're eating. Learning how to cook and prepare simple meals is essential. I was also exposed to a variety of foods at a young age and dined in many authentic ethic cuisine restaurants to develop my palate and become more cultured food-wise. Thanks for that dad! ;) For me, there is no other alternative to eating the way that I do. Let's face it, nature has a pretty awesome array of colors, shapes, textures, fragrances and flavors to excite our taste buds. Eating meat and potatoes is just not an option for this gal nor has it ever been a staple in my home. I like how food allows me to be a bit of an artist too, I love to experiment with the presentation of my food when I have extra time, I think a pretty, colorful display is so appetizing. When I originally became a personal trainer and spent more time working out, my interests were in consuming more protein, less carbohydrates (especially those that were refined), decreasing saturated fats and increasing healthy fats. I still follow that for the most part but I've added many layers to this over the years. Everyone has a different idea of what eating clean is. For some, it's avoiding pre-packaged and prepared foods, for others it's making everything from scratch, buying local and/or organic produce and then there are those who have determined that becoming vegetarian or vegan on top of these choices is best for them as it pertains to eating clean. Now, with so much talk about GMO's (genetically modified organisms), many will avoid anything that could potentially be GMO/GE (genetically engineered). I guess you could say I'm pretty conscious about what I consume. With having been pregnant last year and now nursing Lily, I continue to be extra mindful about what I eat and drink. What do I watch out for? For starters I eat almost exclusively organic to eliminate harmful toxins via pesticide/herbicide use on my produce, it also ensures that it's GMO-free so I know it wasn't genetically altered. Why is this bad? Well, to put it simply the chemical pesticide which is a poison is embedded right into the seed of produce. That means, you couldn't wash it off if you tried, it's growing into the produce. There have been studies conducted already showing in animals how large tumors develop upon eating GMO foods, in addition it can create a whole host of other health problems. Look for the Non-GMO project verified label on anything that is pre-packaged. In addition to this, I really limit sugars and salt but do enjoy a bit of sea salt and Himalayan pink salt (they are really flavorful compared to iodized table salt). For a little sweetness I prefer raw honey, pure maple syrup or coconut palm sugar for baking as it is lower on the glycemic index. I avoid most dairy as I'm allergic (many people have allergy symptoms to milk and dairy but don't recognize the connection) but I make an exception for raw cheese (unpasteurized) but of course ate pasteurized while pregnant, I don't drink milk but instead substitute with Silk unsweetened almond milk but I do eat a bit of plain Greek yogurt and only eat meats that are hormone-free, antibiotic-free and free range, grass fed or in the case of eggs, that the hens were cage-free. While I make a lot of meals from scratch, I like to use the word prepare, because a lot of what I eat is not heated or cooked in any way. Things like salads-veggie or fruit, bean salads, smoothies, raw nut butters like almond butter, seeds, etc., have no reason to be heated and have more nutrients as a result. If you're going to cook, baking or roasting is best vs. frying or even grilling (barbeques create char on the food which is a carcinogen as is lighter fluid that many often use when they grill-for that reason it is a treat for me and not a daily way of cooking). Let me say that I'm not vegan nor am I vegetarian but I would say that my diet is about 85% vegetarian with the remaining 15% open to fresh wild caught fish, poultry, beef, bison and lamb. I've decreased the amount of fish I consume and ate almost none while pregnant as most contains mercury now, the safest bet is small fish like sardines. Between Fukushima radiation that has spilled into the Pacific and so much fish being farm raised, if I do eat the odd bit of fish it must be fresh, wild caught fish which is almost always Alaskan Salmon, specifically sockeye. I have a really good fish oil supplement that I take instead for DHA from Norway that has no traceable toxins or heavy metals. For hygiene reasons as well as personal spiritual reasons I do not eat shellfish or pork due to the amount of parasites both contain (the bible instructs not to eat various foods for a reason with a focus on shellfish and pork). At this point, you're probably either wondering what the heck I do eat or perhaps feel overwhelmed by my exhaustive list. It's really not as daunting as it seems. For me, it doesn't end there though. A few years ago I started breaking out into hives and tried for a very long time to determine the culprit. It wasn't until I became a food detective of sorts and removed all food with preservatives, food coloring and more specifically MSG (to which there are hundreds of derivatives such as autolyzed yeast extract, carageenan, hydrolyzed soy protein, etc. and many more names) that I saw a dramatic improvement. My previous reasons for eating clean were to remain fit, keep my organs healthy and maintain high energy. I still continue for those reasons but now I eat this way for my own body plus my baby girl's and to keep illness, disease, hives and allergies at bay. Everyone has different reasons for changing their diet such as discovering they are borderline diabetic or maybe they learned they have Fibromyalgia like my mom was diagnosed with 20 years ago when nobody really knew what it was (by the way she pretty much cured herself with a ton of walking, lots of water and eating in a more clean way). Some wish to eat clean to lose weight and that is great. What has always saddened me is to see people try to lose weight by living off of brand name weight loss products and foods which remove sugar and fats but replace it with a ton of chemicals and are essentially not real food. These toxic chemicals accumulate in our body's fat cells as they are unrecognizable and essentially cause us to gain weight! You most certainly do not need to do exactly as I'm doing when it comes to diet, and again to reiterate, this has evolved over a 15+ year timeline so how you decide to change your diet today (if you are planning to) will likely start out one way and change months or years down the road as you research and learn more about optimal health on your own and listen to your body. Whatever your reasons are for desiring to eat in a more healthy and clean way, I've got a bunch of great tips that I hope you'll find really helpful and simplify the idea behind clean eating. Beyond all of this, the most important thing you can do is read books that educate you on food and nutrition and allow you to make smarter decisions, we must take responsibility over our own health, nobody else will do it for us. A classy woman makes caring for her mind, body and soul a priority and makes the best possible choices with the knowledge she has. 1. Eliminate Pre-Packaged Foods-One of the easiest ways to eat clean is to remove pre-packaged foods. Most pre-packaged foods are filled with what I call white death: sugar, salt or white flour, preservatives, food coloring, artificial flavors, GMO's, hormones, antibiotics and a whole lot of other nasty things. This is not to say that you should eliminate everything that comes in a package. Granola-based cereals with few ingredients can be great, plain Greek yogurt without sugars or artificial sweeteners is another example. 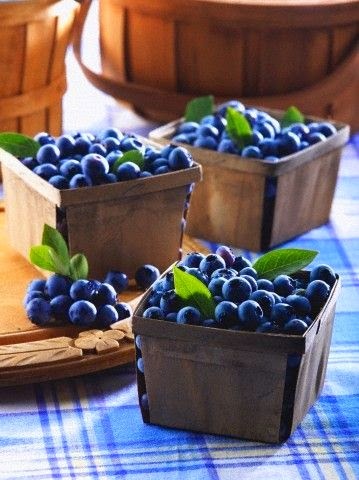 You can always add your own fresh or frozen fruit to it or a natural jam sweetened with juice vs. sugar for example. If you have a choice between buying pre-made items or making it fresh, always make it if you can! Great examples of this include: almond butter, guacamole, salad dressing, etc. These are a cinch to make from scratch and you'll know exactly what is in them. 2. Increase Your Vegetable Intake-Both fresh and frozen veggies are great choices, I would not recommend canned vegetables as they sit for a while and are in a metal can that most likely contains a chemical called BPA in its lining which is a hormone disruptor. Fresh, local organic veggies that are in season are best. Take advantage of produce when it's at its peak. Put an emphasis on greens and more bitter veggies. Kale, broccoli, mustard greens, collard greens and spinach are all excellent choices. For salads I rotate between mixed greens, kale and my personal favorite-arugula also known as rocket greens-they have a fantastic peppered flavor. Try to eat a variety of colors, textures and flavors. Sweet veggies like roasted beets and sweet potatoes for dinner replace my need for dessert so it's a win-win. 3. Go Organic, Grass-Fed, Pasture Raised & GMO-Free-Whether consuming produce or animal products, be sure to eliminate all of the unknowns by buying those without antibiotics, hormones, GMO feed fed to the animals and ensure the animals are not living in feedlots but have the ability to roam freely. It's not only better for the animals quality of life but you know the conditions are cleaner so there is less disease also. When we vote with our wallet, we increase the demand for such products which will drive down the cost. 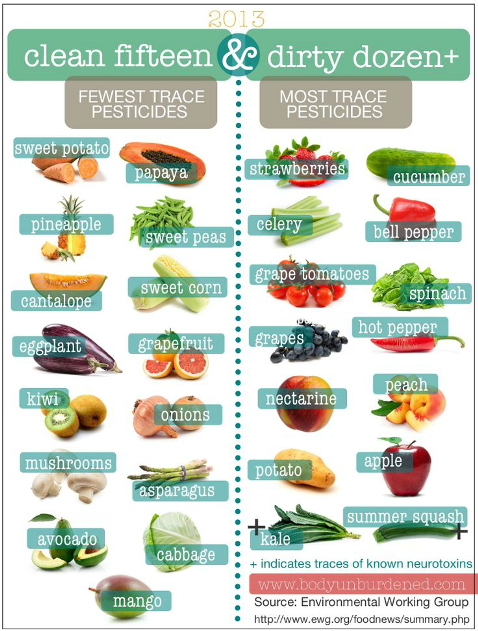 If you cannot buy all organic, start with what you eat the most of and also consider the dirty dozen and clean fifteen lists which outline which produce with the highest and lowest pesticide load. Personally, I began with the dirty dozen list and slowly added to it with the produce we ate the most of and we are now almost 100% organic. 4. Replace Saturated Fats with Beneficial Fats-This might be a shocking fact for some, but our brains are made up of 70% essential fatty acids! We require fat for our brain to function properly but it needs the good stuff. Saturated and trans fats are the ones we wish to avoid. The oils I recommend are: Extra Virgin Olive Oil, Extra Virgin Coconut Oil and Flax seed oil. You can use any of these instead of butter or margarine. I love spreading coconut oil when it's in its solid state on toast topped with my favorite jam. Since it can be heated to high temperatures over 400 degrees, it's the perfect choice for both baking and cooking. Do not heat flax or olive oils as it changes their composition and actually turns them into a bad fat.You'll want to avoid: Canola, Vegetable oil (corn, soy, sunflower), peanut oil, etc. Since canola, soy and corn are over 90% genetically modified, unless you're buying organic, you can guarantee it's GMO-free. The best way to consume beneficial fats and oils is in their raw state. So, if you make a pasta dish, add it in after you are finished cooking to preserve and protect the oils as you are garnishing your dish. Stir frying, deep frying and regular frying pan methods of cooking are not a part of a clean eating diet. 5. Incorporate Juicing & Green Smoothies-I'm a big fan of juicing. Why? Because you are getting a concentrated amount of vitamins. minerals and nutrients from produce which goes straight into your bloodstream since there is no fiber to slow it down. If you've watched the juicing documentary 'Fat, Sick and nearly Dead' you can see that juicing alone as a fast of sorts can produce amazing results. Believe it or not a tall glass of fresh pressed vegetable or veggie-fruit juice can actually fill you up. Once your body gets what it needs nutritionally, it no longer feels deprived an constantly hungry which is the main reason for overeating and always feeling hungry. I'm a believer in fiber too so I use my Vitamix to make green smoothies which essentially pulverize the veggies down into a liquid, it powers through seeds and thick, fibrous stalks like kale stems in seconds. This is perfect for on the go. One of my favorite morning smoothies which I shared on instagram many weeks back is kale-orange juice-banana and if I want a little extra zing, I add some fresh ginger. 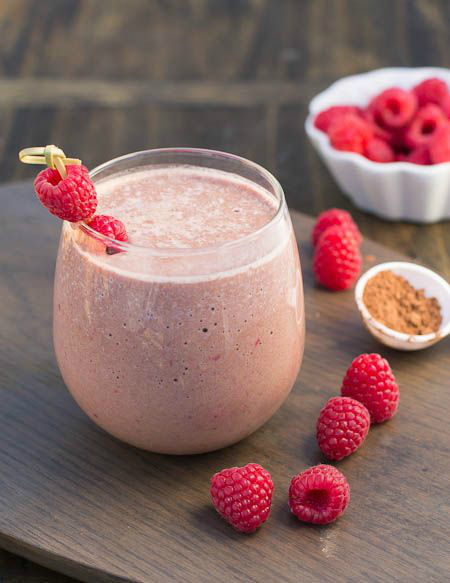 There are thousands of ingredient combinations to make the smoothie or fresh juice blend of your dreams and they are so portable and easy to drink on the go making it the perfect snack or meal. The Vitamix is a bit of an investment compared with a traditional blender but it is so much more than that and it is commercial grade, it's what all the restaurants use plus they last forever and have a phenomenal warranty and it essentially eliminates the need for a counter full of small kitchen appliances-I highly recommend it! Here is the one that I have. I use it to make fresh fruit sorbet, as a food processor to make Lily's baby food purees and also for turning grains into flour such as oat flour with the dry grains container and many more uses. 6. Increase Your Fruit Intake- Yes fruit has sugar, some diets advise you to avoid it for that reason, however fruit has a lot of vitamins, minerals and phytonutrients that are necessary for optimal health. Berries in particular are a powerhouse of antioxidants. The key is to eat less high-glycemic and sugary fruits and replace with those that are not quite so sweet. Bananas are quite sugary but a granny smith apple is more tart, so it's all about balance. Berries are perfect, they are not overly sweet, pineapples are filled with enzymes to help break down and digest your foods and melons, particularly cantaloupe help alkalize the body so it's not in an acidic state as acidity is known to promote disease. One piece of fruit per meal or less is ideal, you don't want to live on fruit all day. Some forget that avocados are a fruit-they have a little bit of protein, a whole lot of good fats and very little sugar. 7. Decrease Your Meat Consumption-While meat has needed protein which is the essential building blocks of muscle, eating too much meat can really cause your body to get clogged up and meat is highly acidic, not a state we want our body to be in. Meat also contains saturated fats that are best to minimize as they are hard on our heart and can contribute to high cholesterol and high blood pressure. You'll likely find that by decreasing the amount of meat you consume that you'll actually have more energy as meat takes a lot more effort for our body to digest. It's also important to note that meat often times is recalled and has a high probability of e.coli. 8. Buy Foods With a Short Ingredient List-Eating was never meant to be so complicated that a single power bar or even salad dressing contain 50 ingredients (most of which we cannot pronounce and if we can, don't know what the heck it is). The answer is simple-buy foods with as few ingredients as possible. Obviously eating produce is the best as there is only one ingredient. When it comes to on-the-go snacks I tend to reach for nuts (look carefully as many have added oils, salt and gasp...BHT! That's a toxic chemical used to preserve the nuts. I always buy raw, unroasted and unsalted nuts. I do have a few go-to bars that I like and have between 2-5 ingredients, Larabars and Kit's Organic bars, I love the variety of Larabar flavors but they are not yet organic so I stick with the banana bread and coconut cream flavors. They are the perfect 200 calorie snack and filled with nuts, dates and fruit. I would rather choose an item with 3 ingredients that has healthy fat and natural sugars than choose a 100-calorie snack pack loaded with processed junk that appears to save you calories but fills your body with chemicals it doesn't recognize. I can promise you that this way of eating will never allow you to come out ahead, it's a psychological mind game the food industry plays with consumers. 9. Reduce Salt & Sugar-Eliminate or reduce both sugar and salt but please don't replace them with artificial sweeteners and forms of MSG instead of salt! Sugar has been my personal weakness, I have a sweet tooth so finding great alternatives to really sugary things over the years has been a mission of mine. I'm okay with natural forms of sugar such as that from fruit which my body recognizes but still try not to go crazy with those either. I do like cupcakes and cookies but I just make a smarter version of them now. As mentioned above, I favor maple syrup, coconut palm sugar and raw honey. I used to use agave nectar but not anymore as it's linked with adding visceral fat to the liver even though it's sort of natural it's actually quite processed. When I buy foods with some sugar in them, the list must say cane sugar as regular sugar often times is genetically modified from sugar beets-sneaky right? Sea salt is full of minerals as is Himalayan pink salt unlike table salt otherwise known as iodized salt so it's best to replace it. Some use iodized salt for obtaining iodine however you are best to take an iodine supplement vs. rely on salt for the source as sodium increases blood pressure and is stripped of all vital minerals when it's processed. Sea kelp is a great source of iodine as well as many other nutrients. Once you start incorporating more fresh and/or dried herbs and spices to your cooking, you'll rely less on salt as a flavor enhancer. 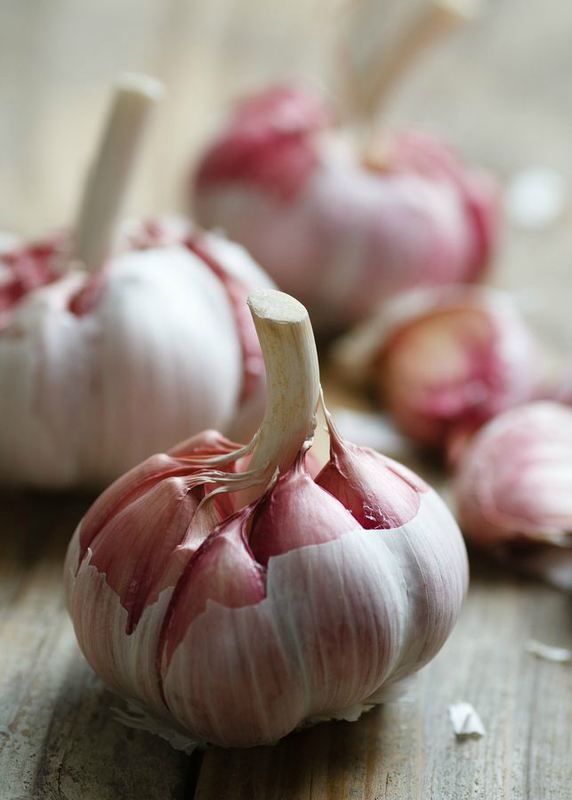 I am a huge fan of garlic so our house is always stocked with several fresh bulbs and I like to eat a few raw, freshly peeled and pressed cloves with at least one meal per day-it adds a great kick to so many foods. While finding better alternatives, a smart bet is to get used to the real taste of food without the need for additional sugar and salt, we consume far too much as a population. 10. Increase Your Water Consumption-One of the best things we can do to keep our body clean is to drink more water as it has a cleansing and detoxing effect. Too much of anything is not good and can actually wash away your enzymes and good internal bacteria so a safe range is 8-16 cups per day (8 oz size) that's 2-4 liters. I know people who drink more than 2 gallons per day and they are sick all the time because they're washing everything away. Water will keep you properly hydrated which in turn allows your organs, especially your liver and kidneys, to get flushed in the process. It also keeps your skin hydrated too which creates a more beautiful and clear complexion and less appearance of wrinkles. Water is essentially youth in a glass. If you are working out or in extreme heat, you'll want to drink more to compensate for perspiration. Not just any water will do thought. Tap water, while tested by your local city, is often filled with chlorine and fluoride which are neurotoxins. In our home we invested in an alkaline ionizing water filtration system with a reverse-osmosis component to remove the fluoride. It's something we saved up for and prior to that used a Brita filter for a couple years and then transitioned to buying gallon jugs of alkaline water from our local health food store. I carry my Life Factory glass water bottle with my everywhere. It's better for the environment vs. plastic and I know I'm not drinking chemicals that plastic water bottles leach, especially on hot days when it sits in the car. The silicone sleeve keeps it from breaking-mine has been dropped a few times and is still in perfect condition. This is the exact bottle I have in mint. If you find water boring, here is a post I wrote sharing some easy and refreshing ways to add some flavor. 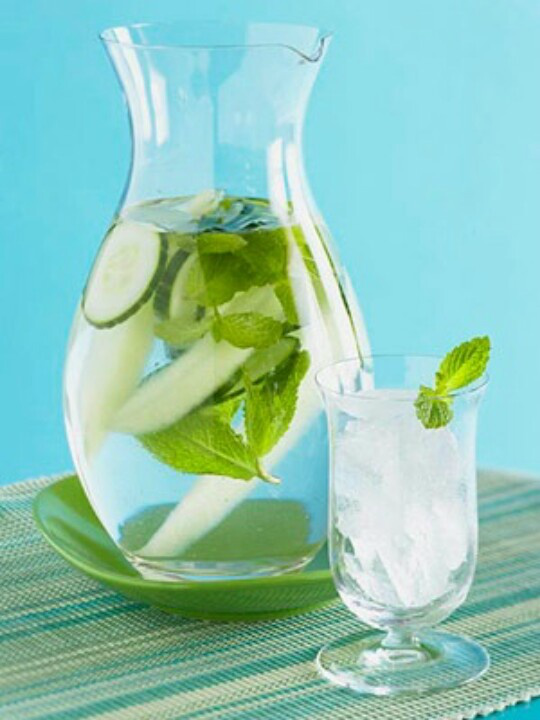 My favorite way is to add some cucumber sliced and mint sprigs for a refreshing spa water. 11. Go Raw- While there are many benefits to eating certain foods (such as tomatoes for the highest amount of lycopene) cooked, for the most part, a raw diet where produce isn't steamed, boiled, baked, fried, stewed, grilled, etc., retains many more vital nutrients such as antioxidants, vitamins, minerals, beneficial plant sterols and essential fatty acids. 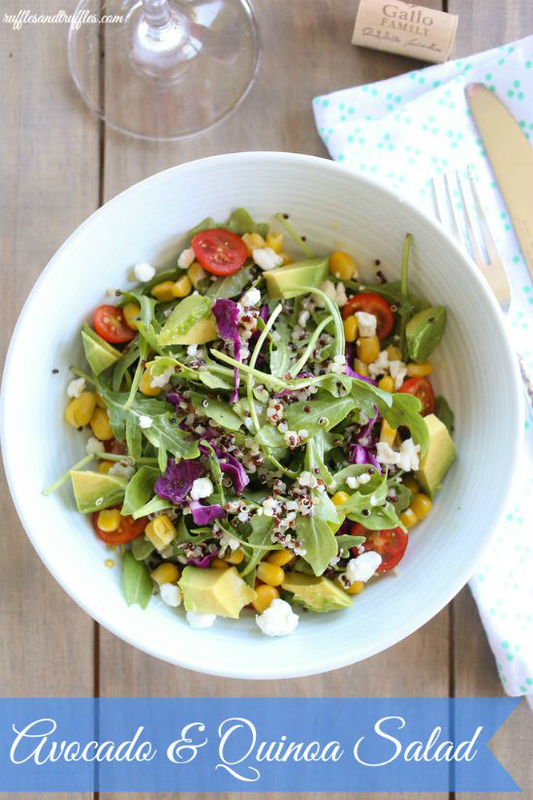 Green salads are an obvious choice and are quite easy to prepare, however you can expand your fare to other areas such as desserts, soups, etc. There are many websites (Pinterest is always a great resource) for recipes such as raw cacao fudge (which I've made many times and my hubby raves about!) or cold soups that don't need to be heated. Eating raw in terms of temperature is anything that has not reached 115-118 degrees (different raw foodists have different specific temps in mind). Many raw foodies also use food dehydrators as a means to make little crackers and others snacks. If you're no interested in making them there are several brands commercially available in health stores such as Whole Foods. I tried going raw entirely for a full 7 days and it was definitely tricky, it requires a lot of thought but to replace even one cooked meal per day with a raw one is a great place to start. A colleague of mine several years ago went raw for an entire 30 days (her goal was to lose weight) while she did experience some weight loss, it was her glowing skin that had everyone in the office talking! One of her lunch dishes that comes to mind was green cabbage wrapped mango with a pureed cashew cream on top with fresh sprouts and mint. You really taste all of the flavors so much more when you eat raw, and get in touch with what you're eating a different way. 12. Eliminating Bad Beverages-This one may be easy or difficult for some depending on your lifestyle. For many, a glass of wine to end their week or evening is a ritual and yes there are benefits to red wine such as the resveratrol component however alcohol in general is dehydrating and taxes the liver causing it to work far harder than it has to. For an already junked up liver that needs detoxing, this just complicates things. Other drinks such as liquor and fruity cocktail drinks along with beer increase not only your calorie intake but more specifically your sugar consumption which does nothing to further along any efforts in clean eating. A treat here or there such as a celebratory glass of champagne is how I tend to do things (except for right now as I'm still nursing Lily and of course didn't consume alcohol while pregnant). Clean eating is not about complete deprivation so on occasion to have a glass of wine isn't going to completely derail your efforts. Everyone must make this decision for themselves but it's important to know that it slows the metabolism way down also. A larger issue than alcohol is actually soft drinks and energy drinks. Did you know there are 16 teaspoons in just one can of Coke? That is more than a full day's allotment of sugar, that is for sure! I believe that beverages can be as big of an issue if not more so than food. They are quick and easy to consume on the go and are filled with empty calories. Don't even think about replacing the sugar with the diet version which is filled with aspartame, splenda, acesulfame potassium and the like which are chemically made artificially sweeteners that have been proven to cause not only cancer but digestive issues not to mention the fact that they actually cause your body to crave sugar-the very thing you're hoping to avoid! Many people have a juice habit they have to kick. I'm not talking about fresh squeezed juice from a juicer but the kind that comes in a bottle pre-made. Some believe it is healthy because after all, it's juice and comes from fruit, right? Anything purchased from a store has been sitting in a cold case or on a shelf for a while and there is little nutritional value not to mention that it's devoid of any enzymes after having been pasteurized. Fruit juice is full of sugar, so it's best to consume the fruit to include the fiber. If you are going to make fresh pressed juice, focus more on veggie intake and consume it immediately after juicing for maximum benefit. For many, when it comes to clean eating, the argument is that there simply isn't enough time to eat healthfully but the alternative is bleak. We can either put in the time now and eat the way we know we should or spend our time sitting in a doctor's office or worse later on in life. Plus, eating fresh, raw and clean just feels good. When our body gets what it needs, it's happy and functions the way it should, causing us to enjoy an overall better quality of life. Cooking and preparing meals as well as snacks does not need to be complex. I assure you that you can create fabulous meals without sacrificing too much time in the kitchen and they will be meals that your family will enjoy. It may involve changing one's palate over a few weeks while retraining the taste buds but it will be time well spent. Lastly, if you want a great book recommendation, honestly there are so many to choose from on clean eating (I've linked a few great ones in my favorite products scroll bar at the end of this post), but I'm currently reading: 'Eating on the Wild Side' by Jo Robinson. It is a fabulous read. Why? Jo shares the best versions of the food we eat, which have the most nutrients such as purple carrots vs. orange carrots and why baby carrots are a waste of time. Moreover though she reveals the combinations of foods that work together to produce the highest nutritional content and how best to consume the produce we buy. Definitely a book for you library! Once again, please let me reiterate that each person must ease into any new way of eating and of course if you have health issues, do consult your doctor. Food is truly our medicine though so it beats any chemical pill that could be prescribed. *Using the scroll bar above, you can click on any of these items and you'll be taken directly to their source for more details where you can grab them for yourself and implement them into your own daily routine. Now it's your turn....share with us in the comments below what you're doing to eat more clean these days.